Registration is now CLOSED. Sponsors and Donors are always welcome. This Rally is a camping and meet-up event....also we get to eat and raise $ for charity. May look well organized but really not an organized riding event. Riding is whatever you and your friends want to do; and for sure hundreds of miles of dirt not far from camp. click "DONE" on the upper right corner. MVI, sugaree, Elad and 6 others like this. YOU CAN STILL JOIN IF YOU'RE A SPONSOR OR DONOR...PLEASE SEND ME A PM. Last year, we didn't get the top billing, maybe this time we'll beat the Quilts. We reserved the entire Petrack Park for our private use. Your registration includes free camping. Thanks to JAB of Diamond Lines for subsidizing the cost. 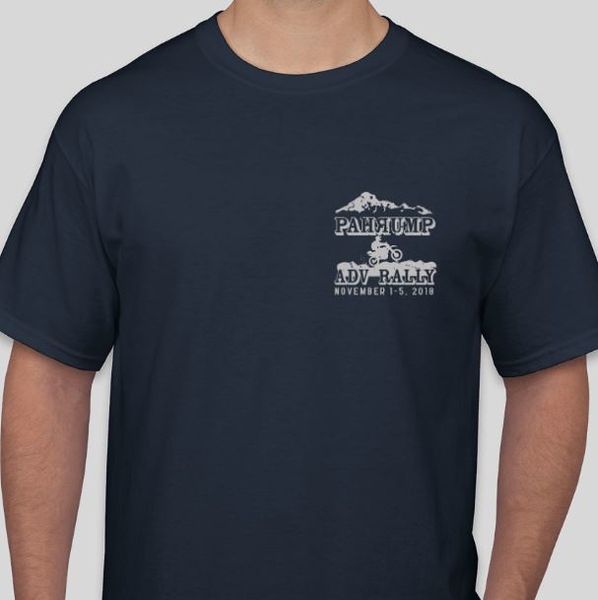 Commemorative TEES.... i will have about 80 made of various sizes. $12 for MEDIUM to XL - available at the rally. first come - first served. drmiller100, Elad, Vivian and 1 other person like this. Wheeler Pass: This is a dirt road that makes a nice trip through the Spring Mountains taking you from Pahrump to Hwy 95 (between Vegas and Indian Springs). The pass is at about 7,700 feet elevation. There are remains of some charcoal kilns to see on the way. You can make an up and back trip, or continue to Hwy 95 and make a big loop ride (either clockwise or counter-clockwise). This website has some good info. Mount Charleston: If you take Wheeler Pass and decide to make a clockwise loop, you can hit the Mount Charleston Lodge for lunch. Charleston Peak (above the village of Mount Charleston), just shy of 12,000 feet in elevation, is the highest peak in the Spring Mountains. Take Lee Canyon Road or Kyle Canyon Road from Hwy 95 (more of a big bike ride). Red Rock Canyon: The Red Rock National Conservation Area features some stunning scenery, rock formations, and sandstone peaks. It features a 13 mile paved scenic drive, and plenty of hiking opportunities. Accessible off of paved Hwy 159 (requires National Park Pass or pay a fee), you can also reach the park offroad via the Rocky Gap Trail, a challenging rock-filled climb from Lovell Canyon Road (best for small bikes or skilled big bike riders). Rocky Gap is the last "hard-way" challenge of the infamous LA-to-Barstow-to-Vegas Dual Sport Ride. More info about Red Rock Canyon here. Bonnie Springs Ranch: Just south of the Red Rock National Conservation Area, Bonnie Springs features a replica western mining town of the late 1800's. It was actually a stage coach stop on the Old Spanish Trail. Decent burgers at the restaurant. Check it out here. Pioneer Saloon: The legendary Pioneer Saloon, located in Goodsprings NV, is one of the oldest continuously operated saloons in Nevada (established in 1913). It may also be the oldest tin-sided building left in the U.S. It has been a location for many commercials, TV shows, and movies. It is also where Clark Gable waited for 3 days in 1942 to wait for word about his wife Carole Lombard, who was tragically killed in an airplane crash near Mt. Potosi. 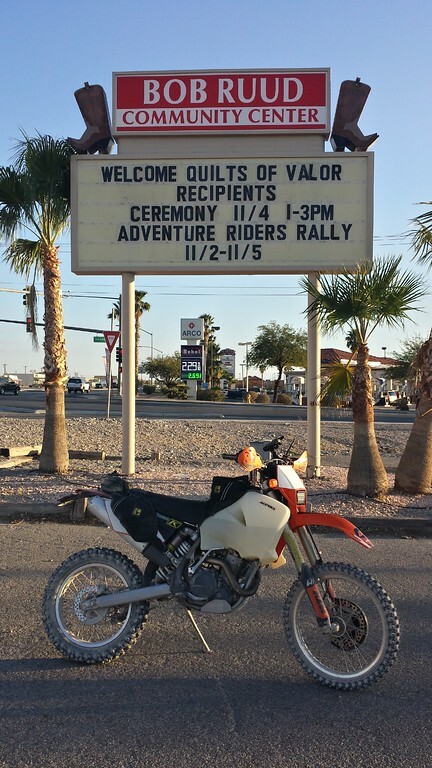 Pioneer Saloon is a common destination for little and big bikes rides at the Pahrump Rally! It's a great spot for lunch or a cold beer!! Colosseum Mine: This now closed open-pit mine is an interesting place to visit. It was an operating gold and silver mine (and other minerals) from the 1930s through about 1993. It is located just west of the Ivanpah Solar Electric Generating System (ISEGS) plant. Can be another little or big bike ride depending on the route to get there. More info here. Mojave National Preserve: Abandoned mines, Joshua trees, volcanic lava tubes, sand washes, dirt roads, and beautiful scenery can all be found in the Mojave National Preserve. Located east of I-15 and south of Primm, the Mojave National Preserve is a 1.6 million acre area destination maybe most suitable as a big bike destination just due to distance from Pahrump. Dumont Dunes: This is a large OHV riding area among sand dunes as large as 400' high. You should have a pass to ride within the dunes area. Located about 25 miles south of Shoshone off of Hwy 127. There are paved and dirt routes to get to the dunes. More info here and here. Sand whip flags should be used. China Ranch Date Farm: Whether you are on a small bike or big bike ride, if you get close to Tecopa then stop by the China Ranch Date Farm. Try a date shake, date bread, date cookies, or just some fresh or dried dates. It's all delicious! They also have a quirky little gift shop to buy that unique curio to bring back home. Just a few miles south of Tecopa. Tecopa: Tecopa is a quirky little desert town with the main attraction being several commercial and free hot springs and mud baths. Go enjoy a soak for your tired muscles. While you're there, visit Death Valley Brewing for a cold one; or Tecopa Brewing Company that also offers some decent BBQ. Shoshone: Not much to Shoshone, other than being perhaps an important stop for gas if you're riding west from Pahrump (such as towards Death Valley). More than one rider (@rjnutt) has cruised into Shoshone on fumes, thankful to see the Chevron station in town. Across the street from the Chevron is the Crowbar Cafe and Saloon for some good eats! Death Valley: Yes, Death Valley is in riding distance of Pahrump (especially for big bikes, but for little bikes too). There are paved and dirt options to get to DV. Go see Rhyolite and ride Titus Canyon; visit Badwater and Artist's Palette; or any of the other many beautiful spots in Death Valley. Ash Meadows National Wildlife Refuge: Home of the famous Devil's Hole Pupfish, the Ash Meadows NWR is an interesting habitat for a variety of flora and fauna unique to the desert environment. It has an excellent Visitor's Center, and contains the largest remaining oasis in the Mojave Desert. Amargosa Dunes: Also known as Big Dunes, the Amargosa Dunes are another OHV play area located west of Hwy 95 south of Beatty. Sand whip flags should be used. Pahrump Valley Winery: Why not visit Nevada's largest producing winery located on Winery Road at the south end of Pahrump. Better yet, stop by their restaurant Symphony's for a great up-scale dinner one night while at the rally. Pahrump Valley Museum: Located about 1 mile west of Petrack Park (the rally site) on Basin Avenue is the Pahrump Valley Museum. Stop by and learn a little about the history of Pahrump and the Pahrump Valley. Free admission - hard to beat that! 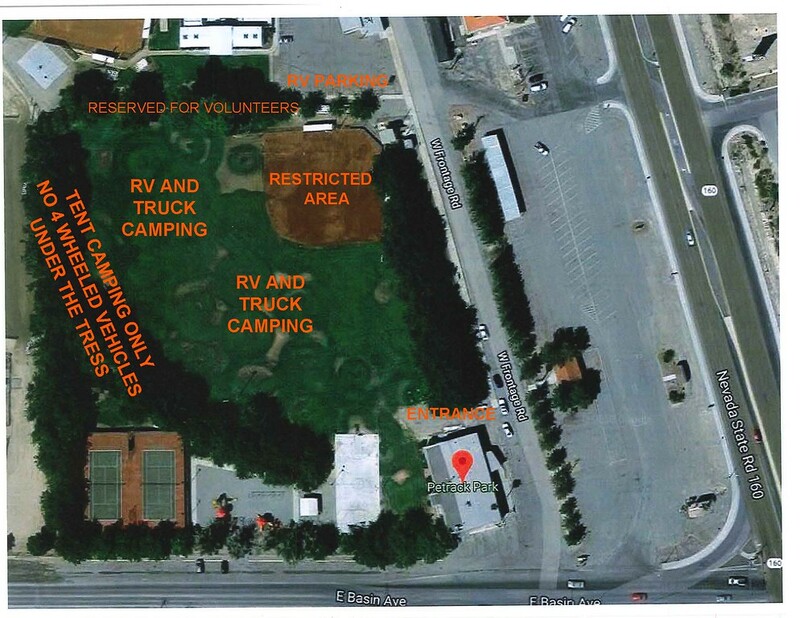 Pahrump Valley Speedway: Local 4-wheel dirt track racing about 1-1/2 miles from the rally site. And they're holding races on Saturday, Nov 3 during the rally. Races start at 3pm, so you can see a few races and then head back to the rally for dinner and the ever-exciting raffle! Maybe Joel can talk them into letting some of us 2-wheelers hold a Pahrump Rally Flat-track Championship! Jimmy Lewis Riding School: Jimmy Lewis bases many of his off-road riding classes out of his home is south Pahrump, and utilizing the great riding areas around Pahrump. You will become a better rider after taking his class. See a review. Check the next post in this thread for information about the class that will be offered Wednesday and Thursday before the rally. 4serge, Steve G., Vivian and 10 others like this. Jimmy also donate part of the proceed to land use. Jimmy stated 12 riders/learners is optimal. Post up or PM me if interested. Please await further PM/Instruction as we are getting closer. Vivian and NSFW like this. Please check back later for more information to follow. Davethestick, dunerat, azbarbee and 1 other person like this. become a part of history and join us ! End of Daylight Savings Time so we have an extra hour to get home. KaptSlo, fishslapr, Team Vegas and 2 others like this. I am working on a good little bike loop, a bit Kaptslow and LAB2V mixed. I will ride red rock canyon this year as well. KaptSlo, fishslapr, socially stunted and 3 others like this. Davethestick is in. Will not miss this. bsham, Greedyg76, Team Vegas and 2 others like this. Still recovering from DVNR, but IN. jnyrav and NSFW like this. surfgimp and Davethestick like this. In, trucking in with a small enclosed trailer for hauling bikes and sleeping. I will lead the easy loop through death Valley like two years ago. Greedyg76, surfgimp, DESERTJUL and 3 others like this. surfgimp, Greedyg76 and Team Vegas like this. Davethestick, rjnutt and headstaller like this. Speed Racer and Davethestick like this. WTP, are we on the 4th year already. In, at least as much as I can commit to 8 months out. Davethestick, Speed Racer, Sfcootz and 4 others like this. COUNT ME IN, FAM. I'm sure I can learn to ride a bike by then. We must do whatever it takes to get the top billing on that sign, that should be priority #1 for this rally. Davethestick, Team Vegas, spafxer and 1 other person like this.